This blog post was inspired by a topic I brought up in my recent webinar How to Leverage Your Online Presence to Market Your Translation or Interpreting Business (by the way, you can sign up now for the next one!). I mentioned to attendees how I keep Swipe Files and what keeping files like these can do for your business and your ongoing knowledge of your ideal clients. 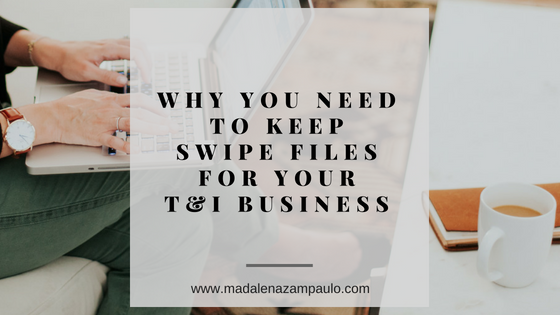 Essentially, Swipe Files are something I believe every translator or interpreter should be keeping for their business, regardless of whether they prefer to work with translation/interpreting agencies or direct clients. So, what is a Swipe File? In a nutshell, a Swipe File is a file or folder you keep on your computer, in your email, on your phone or other device that you update often and that you can refer to any time you need to create new marketing content or want to do research on a certain client or market you wish to target with your services. These files could also be called info banks, data mining or content collecting. There are so many ways to keep and use Swipe Files to remember information that could help you market or grow your business in other ways. Here are a few ways to organize Swipe Files for your business and the kind of information you could keep in each one. 1. Create a Swipe File folder or a series of folders and store them on your computer's desktop or even in a cloud-based file organization system, like Dropbox or Google Drive. Gather information about your ideal client and save it in this folder or in an organized series of files that you can refer back to when you need content to feed your marketing efforts. Take screenshots of social media posts or forum conversations with things that your ideal client wants to know or has issues with (his/her pain points, challenges, etc.) that you can help solve. Make notes of little details, quirks or interesting tidbits that are specific to your target market. You never know when this type of information will come in handy for a marketing campaign! The more information you can gather about your target market's challenges, the easier it will be for you to market your solutions in a way that speaks to your ideal client. If you see an ideal client asking a specific question in a forum or complaining about something related to their job, take a screenshot of this, post a comment if you have a solution and bank the information to help you create marketing content, like social media posts, warm emails or blog posts. You could even keep a Swipe File that is specific to each of your current clients that you believe to be ideal (i.e. those you want to keep working with!). Keep this information handy, and tap into this information to use creatively in emails when you write to them. ○ Important dates, like birthdays, work anniversaries, etc. Use this type of information to send short notes to them as a way of saying "I remembered 'X' was today. Good luck!" or "Congratulations! ", etc. Your clients will notice that you took the time to reach out to them and wish them well. This may seem like a small gesture, but it can be significant in maintaining great working relationships. 2. Keep a Swipe File of images on your smartphone. Have you recently received a package or a piece of mail with something you ordered or with a marketing slant that you found very effective? How did this piece of mail make you feel? Valued? Understood? Happy? Clearly, it's not effective to keep every package or piece of effective marketing that makes its way into your mailbox. Instead, snap a photo and add the image to a folder on your phone. If you can sync the folder to your desktop computer, even better! Over time, you will have a collection of photos saved of packaging or messaging that you found effective and worth noting. Could you do something similar for your clients? How could you find a way to "package" your services to make them feel valued, understood, or happy? This type of information can be incredibly valuable when you are tweaking your client onboarding process, sending invoices or even basic emails to clients. You will be able to take the common invoice or email and tweak it to make them feel how you did when you opened that fun package in the mail. Be creative and have fun with it! 3. Add a folder to your email account and name it "Marketing Swipe Files" or "Ideal Client Swipe Files". We all get marketing emails from time to time, or even daily for that matter. Which emails or newsletters do you find yourself opening time and again? Add these emails to your "Marketing Swipe Files" folder in your inbox. Analyze which emails you have found to be the most effective in marketing to you, as a customer, and that really "speak" to you. What did the business or sender get right to keep you opening their emails and engaged with their content? How can you do something similar in your own business for your clients? From which emails do you find yourself unsubscribing? Instead of deleting them, keep a folder to house these unwanted emails so that you can look back and remember what you don't want to do in your own marketing campaigns. In a separate "Ideal Client Swipe Files" folder, store emails that you have sent back and forth with your clients (remember, only the ideal ones!) that you want to remember the next time you are crafting a marketing email or writing a new social media post. Did someone ask you a question recently that you are often asked? File it in this folder. It could very well be the question that inspires your next blog post topic or social media post. Does your client speak a certain way or use specific jargon or terms? Take note and try to incorporate this into the messaging the next time you write to them. When gathering content for your Swipe Files, it's important to also look to other industries for inspiration. I get a lot of my own inspiration from graphic designers and copy editors. I find that both of these industries have many similarities to the T&I industry, and yet, they find incredibly creative ways to market to their ideal clients through both images and copy. Once you have a decent amount of content in your Swipe Files, analyze the information you have collected. What can your Swipe Files tell you about your ideal client? What can you do with this information to improve your marketing efforts? What can you learn from what others do in their industries that could be carried over creatively to ours and help you to stand out from others who provide the same services as you? Over time, you will continue to update your Swipe Files as you learn more about your ideal client and about marketing in general. It can be fun to collect the information you keep in your Swipe Files, and it should ultimately give you a lot of insight. Mark some time on your calendar each week or month to search for new data or information to add to your Swipe Files. Doing this will allow you to keep your content fresh and create content based on what your ideal client would want to see from you. It also helps you to stand out as a translator or interpreter in your language pair(s) or area(s) of specialization, because it shows that you know your client, you did your homework and you took the time to find out more about them and their needs. You can be as detailed and collect as much information as you want to store in your Swipe Files. They are truly yours to use for any efforts you have in marketing your business or learning more about the market in which you want to work. You may find that your ideal client or target market can change over time. This is all the more reason to keep updating your Swipe Files to remain relevant in your marketing efforts.